Strongly perfumed and narrowly segemented brown flowers that have widely spreading sepals and petals, a hooded dorsal sepal and a prominant yellow tipped labellum. Erect linear-lanceolate, greyish-green leaf, stout dark scape. Heathy and sedgy open eucalypt forest and woodland, sedgeland, heathland and grassland on poorly drained to well-drained sandy and peaty soils, often in dense vegetation. 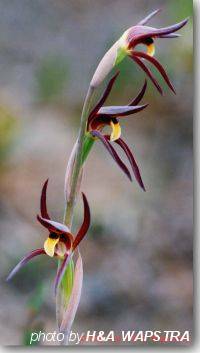 Locally fairly common in coastal and near coastal lowland areas from north-eastern to south-eastern Tas. However it also occurs on Hunter Is., and there is a 1929 herbarium record from Port Davey in the South-west. Also in Qld, NSW, ACT and Vic. Flowering is not stimulated by fires (Jones and Clements 1994). Well represented in reserves. Suitable below powerlines.